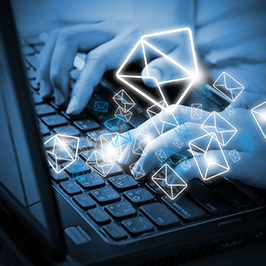 Using email effectively to communicate is essential in today’s world. After all, it is the single most-used communications tool in business and law firms. Email is easy to use and gives the recipient the flexibility to reply when time permits, providing for effective management of our time among the numerous projects and distractions that come at us throughout the work day. It is also a resource that keeps a record of the online communication that you can refer back to at any time, either by reviewing the conversation string or by keyword searches. This is an invaluable feature if you’re looking to confirm what you said or what the response was to a question or the status of a project. Because email is so vital to the modern workplace, it’s important to ask yourself: Am I using it effectively? Using email in business is much different from using it for personal use. Brevity is important. (You’re not writing a letter to update family and friends of your recent vacation experience.) While it might take a bit more time to craft your email to be as targeted as possible, the recipient will be thankful that you are not sending unnecessary content that they need to weed through to get to the heart of the message. Use bullet points to call attention to important details. When asking a question (or set of questions), be clear and specific in what you are asking and what you need in response. Not being clear only adds to generating additional emails unnecessarily, wasting both your time and the recipient’s time. Be mindful of your tone. It is easy to send the wrong message by coming off as angry or snarky. Always be professional. Avoid using ALL CAPS; no one likes to feel like they are being yelled at. Use spellcheck, and avoid typos. Most programs have autocheck built in, so if it is not turned on, consider doing so. Just be sure to check it before accepting its changes, because it could complete a typo with a wrong word choice. Read your message before you hit send. Review for accuracy and grammatical mistakes. When I have an important email to send, I often save it to my draft folder and return to it after a short period of time for a fresh look. Be mindful of how many people you copy on the email. It may be important to include the whole team, but often you are only looking for a specific person to respond. If a response is needed by a certain time or date, make sure you note that clearly. Getting the responses you need to the inquiries in your email message is important. Unfortunately, sometimes people respond without reading too closely. Once you have worked with the people on your team or key attorneys in your law firm for a period of time, you most likely know who responds without answering your question. How often do you request a response that is either open-ended, or ask a multi-part question and get a single-word response of “yes” or “no”? If you have to follow-up again to get the response you need, so be it. Take the time to read an email message and understand how to respond. Not responding correctly just adds to the ongoing email chain and clogs the system with additional unnecessary emails. This wastes time and effort better spent on actual project work. Consider not responding right away after reading the email. This will give you time to digest the message. Often, our first thoughts may not be the best response. Waiting one or two hours may result in a better response. If you are unable to give the email the full attention it needs, reply with a short note stating you will review it later. Of course, give some indication of when the sender can expect a response. That lets the sender know you have seen the email and prevents premature follow-up from the sender. When responding, make sure you address and answer the questions clearly so the sender knows your intent. Just as with composing an initial email, consider putting your response aside for an hour or so to review it for accuracy and grammar, and perhaps even tone, before sending. When responding to multiple questions, make each response its own paragraph or line to separate topics clearly. Just like in the children’s story “The Boy Who Cried Wolf,” if you put “important” into every subject line, eventually they will get overlooked. Instead, use the subject line appropriately. State the request or purpose so the recipient knows what the email is about. If you need a response by a certain date, consider ending the subject line with that date. Often, an email string can morph into a new subject. If this is the case, start a new email instead of hitting Reply, or change the subject line. It will be easier to find the information if you need to refer back to an email. Today’s use of email may be the main means of business communication, but if you find that your email communication is not getting the information you need, take the next step and call the person on the phone. Email is a one-way conversation, and there are times that a phone call is your best way to gather the information you need to complete a project. Being able to ask questions on the fly during a conversation can save a lot of time versus the unnecessary back and forth in email communication. Do you have any other tips or tricks when communicating through email? Leave a comment below or reach out to me, Alan E. Singles, at asingles@jaffepr.com.